What if you could text a picture of your rash to your primary care doctor during business hours and receive treatment virtually? Or get answers to other pressing healthcare questions in the comfort of your own home? Sentinel Primary Care’s relationship-based direct primary care model includes a full suite of telemedicine options. Telemedicine connects Sentinel patients with Dr. O’Connell through the everyday conveniences you already enjoy – your smartphone, tablet, laptop, and home computers. 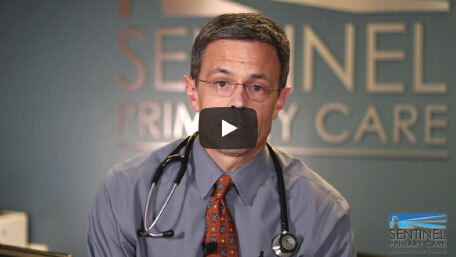 Sentinel Primary Care is committed to top-notch medical care. Our telemedicine services enable Dr. O’Connell to conveniently evaluate, diagnose and treat our patients via text, email and video visits during regular business hours. There are many benefits of telemedicine in Raleigh including privacy, no exposure to other potentially contagious patients, and no travel time to and from the office. Our telemedicine services allow us to offer relationship-based primary care in Raleigh more efficiently to patients within our already affordable monthly membership. Apply to become a member with Sentinel Primary Care today to gain access to our convenient telemedicine services in Raleigh with options to visit your primary care doctor in the office or from the comfort of your own home. It is our goal to help you manage your care with top-notch medical treatment affordably. Now that you understand how our direct primary care model works, we’d like to invite you to our office for an initial visit. When you become a member, you’ll gain access to experienced medical care, little to no wait times, longer office visits with Dr. O’Connell, and much more. At Sentinel Primary Care, our goal is to promote health and vitality for all of our patients. Give us a call and let’s craft your comprehensive health plan together. Schedule your initial visit with Dr. O’Connell today and begin enjoying convenient access to top-notch care via in person, video, email, phone, and text!